Freschetta By The Slice Giveaway! This giveaway is now over. The winner is Mike F. Congrats! We are pizza fans here. I mean, who isn’t? However, it isn’t always feasible for me to make an entire pizza for myself. That’s where FRESCHETTA® By the Slice comes in! You get one perfect slice of pizza. It is super easy to make and super yummy to eat! 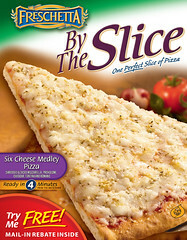 I recently tried the FRESCHETTA® By the Slice Six Cheese Medley, and it was good. I love a pizza I can make in 4 minutes. With all the flavors they have, there is definitely something for everyone. My next purchase will be the BBQ chicken once, since I think that one looks super yummy too. Leave me a comment telling me which flavor of FRESCHETTA® By the Slice you’d like to try. 1. Subscribe to my blog using your Kindle! 2. “Like” Lisa Cooking on Facebook! Good luck! This contest will end May 4th at 11:59 PM CST. This giveaway is now over. The winner is ellen. Congrats! I am always on the lookout for great products to try in my kitchen. Brillo‘s new Estracell sponges is one of those items. It is a more sanitary and reusable sponge. Independent test results demonstrate that bacteria will not feed and survive on the sponge fibers of the Estracell material naturally (no weird chemicals in it). Since Estracell rinses cleaner, it also helps eliminate the single greatest consumer complaint about sponges, the smell. (For me, that is the worst thing about sponges. I can smell a bad sponge a mile away). Best of all? They are more absorbent than paper towels! I love that they have a “wedge edge”, so you can get into those weird hard to reach places. They have several different types of sponges, so you can pick which one is right for the job you need done! What would these sponges help you clean? Is it the table? The counters? Your stove? Tell me in the comments below! Good luck! This contest will end April 1 at 11:59 PM CST. No-Bake Key Lime Cheesecake Bars Giveaway! This giveaway is now over. The winner is Christine. Congrats! My husband loves cheesecake, and I am always looking for easier ways to make it. I like simple but good recipes (as many of my long time readers know) and the Key Lime Cheesecake Bars we recently tried out were amazing. These Key Lime Cheesecake Bars are super easy to make. All you need to make these bars is 1 cup of hot water, 2 8 oz packages of cream cheese, and 5 tablespoons of melted butter. That’s it! No cooking. I mean seriously — how easy is that? Now, I know you are wondering how this tastes. Excellent! The Oreo cookie crust is awesome (how could it not be?) and the key lime cheesecake is good too. There is just enough of the lime to make it good but not overpower your taste buds. Check out the Plentiful Pantry‘s website and tell me what dessert from there you’d like to try! Good luck! This contest will end March 24th, 2010 at 11:59 PM CST.